I am all for inventions which genuinely aid your training, but these have to be separated from all the gimmicks which claim to improve your golf. 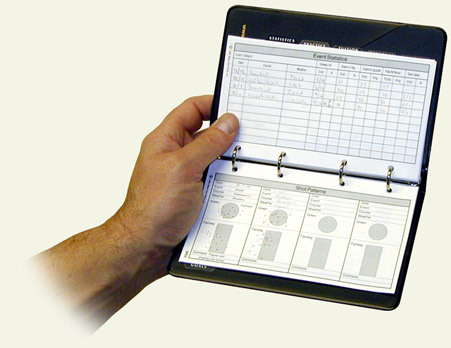 In 2003 I was asked by the Surrey County Golf Union to devise a system which would enable players to record their golfing details and statistics, in order to get a true understanding of their performance levels. And so the ‘Little Black Golf Book’ was born. It is of course more than just a record book, and most importantly, it works. So now when I make my own notes on my pupil’s progress, which I do after every single lesson, many of my pupils make their own tuition notes in their ‘Little Black Golf Book’. The result – a consistent and focused approach to game improvement and better golf all round. 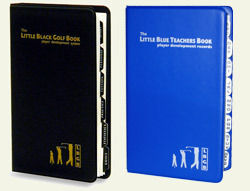 The Little Black Golf Book player performance system has been designed to lead you through each key stage of your development, revealing your current level of performance, which in turn, enables you to identify and strengthen the weaknesses in your game - all with no age or ability barriers. Book price direct £14.99 2 books or more £12.99 each. Plus post & package. Each book has enough pages to last the average user 1-2 years, extra pages are available direct from Lee Johnson. “The Little Black Golf Book has become an integral part of my equipment and preparation, and it’s simplistic design means that it will also be a real asset to club golfers who are looking for improved performance. Juniors will love it too." HAVE YOU SEEN THE ‘LITTLE BLUE TEACHERS BOOK’ ? A simple system designed to store vital pupil information effectively, and organise your teaching notes for easy future reference. GOOD TEACHERS ARE ORGANISED TEACHERS! The ‘Little Blue Teachers Book’ is priced at £17.50 plus P&P and VAT. Contact Lee Johnson for further details.